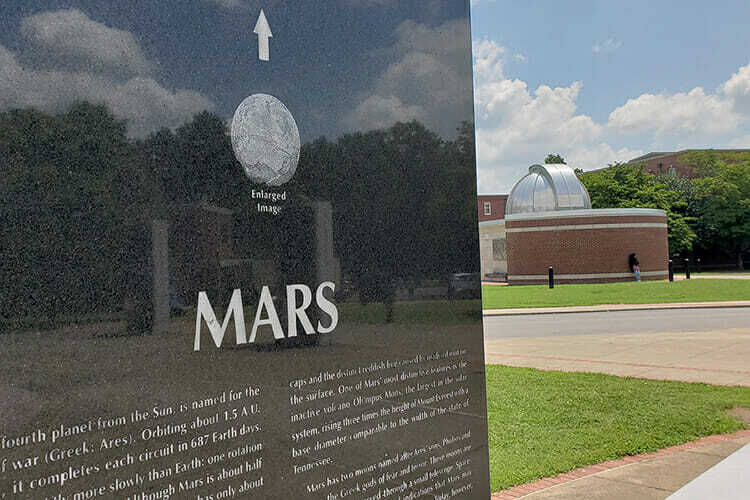 MTSU’s Department of Physics and Astronomy will be giving the public a chance to get a closer look at Mars and other planets during “opposition” on Friday, July 27, for this month’s Star Party event. Dr. Chuck Higgins will lead the event, and other MTSU astronomers and students will be on hand to answer questions and guide the viewing. Viewing the planets will require no eye protection, and they are easily seen in a telescope, binoculars or with the unaided eye, Higgins added. MTSU’s Friday Star Parties have been engaging the campus and surrounding community in Department of Physics and Astronomy activities, specifically topics dealing with astronomy, since 1999. These activities may include guest speakers, followed by telescope viewing outside at the MTSU Observatory as weather permits. The events are always free and open to the public. To find free parking after 6 p.m. around the MTSU Observatory, visit http://tinyurl.com/MTSUParkingMap. The rain date is Saturday, July 28, at the same time. For more information, visit http://mtweb.mtsu.edu/resource25/Star_Parties_Sum18.pdf or contact Higgins at 615-898-5946.